This chapter proposes benchmarking as an important, versatile and promising method in the process of validating simulation models with an empirical target. This excludes simulation models which only explore consequences of theoretical assumptions. 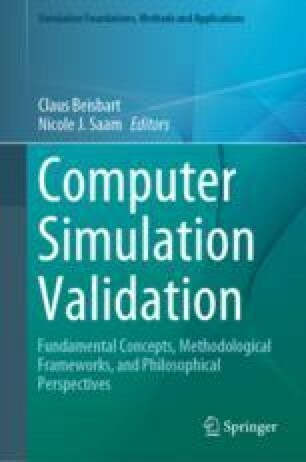 A conceptual framework and descriptive theory of benchmarking in simulation validation is developed. Sources of benchmarks are outstanding experimental or observational data, stylized facts or other characteristics of the target. They are outstanding because they are more effective, more reliable or more efficient than other such data, stylized facts or characteristics. Benchmarks are set in a benchmarking process which offers a pathway to support the establishment of norms and standards in simulation validation. Benchmarks are indispensable in maintaining large simulation systems, e.g. for automatic quality checking of large-scale forecasts and when forecasting system upgrades are made. The author thanks Claus Beisbart and William Oberkampf for helpful discussions concerning this manuscript. Hoffman, F.M., et al. (2017). International land model benchmarking (ILAMB) 2016 Workshop Report. DOE/SC-0186, U.S. Department of Energy, Office of Science, Germantown, Maryland, USA. https://doi.org/10.2172/1330803. Schwalm, C.R., et al. (2010). A model-data intercomparison of CO2 exchange across North America: Results from the North American Carbon program site synthesis. Journal of Geophysical Research, 115, G00H05, https://doi.org/10.1029/2009jg001229.